Sometimes my job takes me in crazy directions (that’s what happens when etc… is part of your job title). Yesterday was one of those days. I spent my day delivering cakes while the rest of the staff was needed in the bakery, working on various sugar elements for up coming cakes. I sometimes forget the joy you bring to people when you deliver a cake. Seeing their excitement, watching their anticipation as you open the box. I work around cakes all the time, so we mostly look at them with a critical eye and sometimes I forget that the outcome to making one of our cakes is always a joyous occasion. This is one of our drivers, Wes, he was helping me deliver all of our cakes. I was all over the city yesterday. 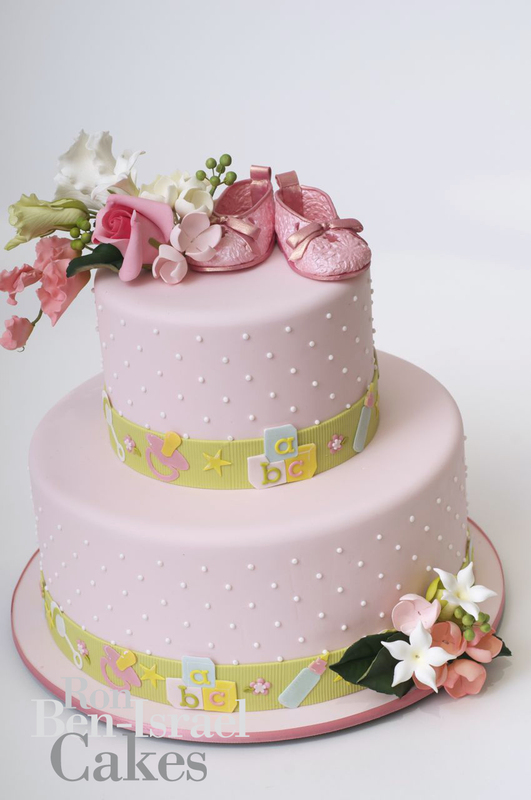 One of my deliveries was a baby shower cake to one of our favorite clients Mrs. Olshan. (Congrats Mrs. O on being a first time Grandmother!) This was something that we designed together over the telephone. The room was really sweet in all pink and white with summery flowers. Mrs. Olshan and her event designer were waiting for me to complete the room with their decorated cake. When I took it out of the box, Mrs. Olshan was so happy with the outcome she had said once again that we out did ourselves. That is such a sweet cake! Love the story especially the part about ect…What a beautiful cake. You guys do amazing work!